We’re also giving away 9 runners-up prizes of a May Gibbs removable wall sticker valued at $145 each. Entry to this competition is via our Instagram page. That’s it! You may enter as many times as you like, each tagged friend is one entry. Open to Australian residents only. Entries close 11.59PM ADST 21/11/18 and winners announced on 22/11/18. The Promoter is Merchantwise Group Pty Ltd (A.C.N. 622 025 496) of 1/ 266 Chapel St, Prahran, VIC, 3181 Australia (“Promoter“). The competition will be open from 8.00PM Australian Daylight Savings Time (“ADST“) on Thursday 15th November 2018 and will continue until 11.59 PM AEST Wednesday 21st November 2018 (“Promotion Period“). 2) Like the competition photo on the May Gibbs Official Instagram page and/or The DIY Decorator Instagram page. 3) Tag a friend in the Comments section of the post on the May Gibbs Official Instagram page and/or The DIY Decorator Instagram pages. This is a Competition of skill and chance plays no part in the determination of the Winners with one (1) Winner awarded the Major Prize. An additional nine (9) runners-up will each win one of the Runners-up Prizes. Subject to the Entrant complying with these terms and conditions, the first ten valid Entries selected will win one each of the Prizes. Judging of the Prizes from all Eligible Entries received during the Promotion Period will take place within two days following the competition close date. The judging will take place at Merchantwise Pty Ltd of 1/ 266 Chapel St, Prahran, VIC, 3181 and will be conducted by a representative of the Promoter. 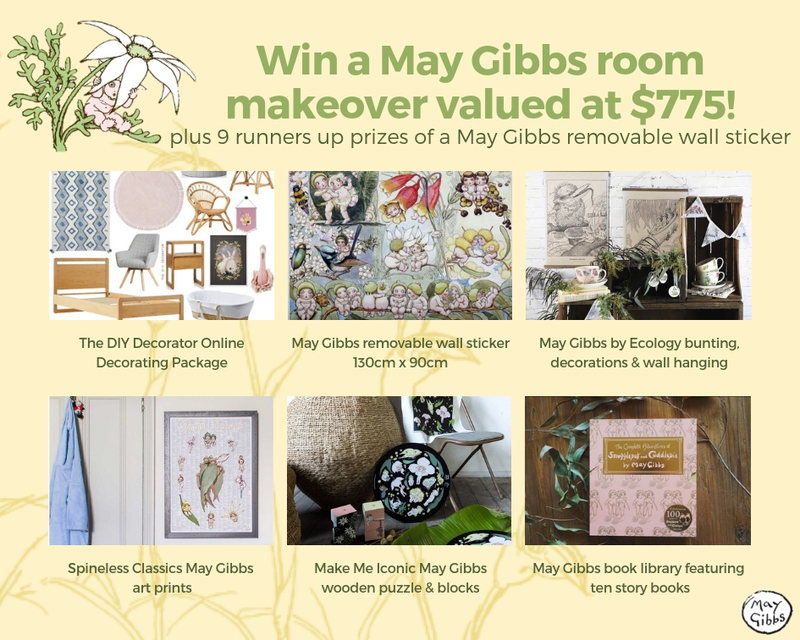 There will be one Major Prize winner selected by the judges, based on skill, and the winning entry shall receive a May Gibbs room makeover prize pack valued at $775. There will then be nine Runners-Up Prize winners selected by the judges, based on skill, and the winning entry shall receive a May Gibbs removable wall sticker valued at $145 each. The Prize Winners will be notified by direct message after the Prize draw and contacted via the Instagram account used to enter the Competition. 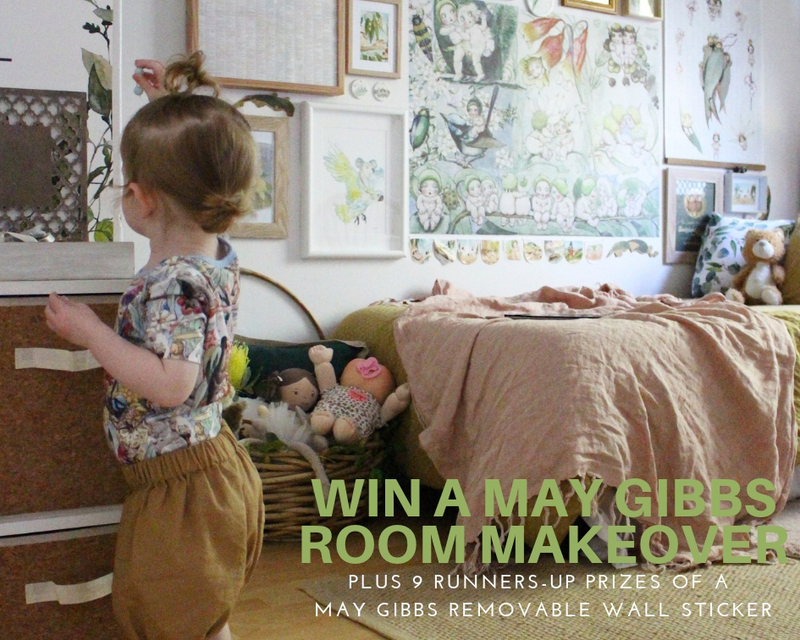 Any cost associated with entering this Competition and/or accessing the May Gibbs and The DIY Decorator Facebook pages and the May Gibbs and The DIY Decorator Instagram pages is the Entrant’s responsibility and is dependent on the Internet or Mobile service provider used. The use of any automated software or any other mechanical or electronic means that allows an entrant to automatically enter repeatedly is prohibited and will render all entries submitted by that entrant invalid.